In 2012, the total electricity injected into ACEA Distribuzione’s network (from the National Transmission Grid, from generating plants directly connected to the ACEA Distribuzione network and from ENEL Distribuzione’s interconnected network) recorded a decrease of 0.07% compared to the amount of energy injected during the same period of the previous year(1). Peak demand on the Acea Distribuzione network in 2012 stood at 2,276 MW, and was recorded at 2.00 p.m. on 11 July 2012. This is down approximately 86 MW, or -3.63%, on the peak of 2,361 MW recorded in 2011, at 1.00 pm on 13 July 2011. The year 2012 saw a confirmation of the high rate of insignificant plants(2)installed (5,775 in 2012 compared to 3,971 in 2011, up 45%). As a result, installed nominal power increased by 32% since last year (129.6 MW in 2012 compared to 98.32 MW in 2011). 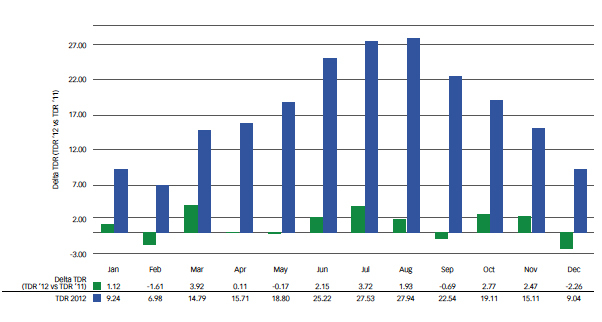 Electricity demand recorded on Acea Distribuzione’s network in 2012 was affected by weather conditions (milder in the spring and autumn and more extreme in the summer and winter), and a higher number of working days (one more working day, taking into account that 2012 was a leap year). In particular, electricity demand increased by 7.70% and 7.43% in February and July, respectively, as a result of colder and hotter temperatures. On the other hand, electricity demand decreased by 5.69% and 8.72% in March and September, respectively, as a result of mild weather conditions (two fewer working days also contributed to the reduction in September). The graph below shows the trend in the reference temperature(3) recorded in 2012 and the average monthly difference of said parameter calculated in the corresponding months of 2012 and 2011. These electricity amounts were intended to cover the needs of the utilities supplied by the above-mentioned network, i.e. the customers of the free and protected markets and of the market subject to additional safeguards, as well as the so-called underlying distributors, which are represented by the electricity company of the municipality of Saracinesco. There are also sales and injections of energy between the ACEA Distribuzione’s network and ENEL Distribuzione’s networks at some LV, MV and HV interconnection points. With regard to imported supply, as from 1 January 2002 ACEA Distribuzione signed an agreement with the Vatican State (that was renewed on 5 August 2011) in force from 1 January 2012 to 31 December 2022, for the optimised management of imported electricity assigned to it (established by Terna, in accordance with the indications provided by the Italian Authority for Electricity and Gas, based on the Decree issued by the Ministry for Productive Activities - now the Ministry of Economic Development - that sets out the assignment of transmission capacity shares to the interconnection with foreign countries for the Vatican State and the Republic of San Marino). (1) Data provided at the end of 2011. (2) An insignificant plant is one with a total power of less than 10 MVA. (3) The reference temperature (TDR) is defined as the weighted average of the daily temperature highs and lows which better reflects the effect of the weather on electricity demand. The reference temperature trend shown in this report was drawn up on the basis of updates to historical series’ carried out following the drafting at the end of the half in 2010. (4) Energy figures which discount the impact of the weather and the calendar were calculated by using de-climatisation, de-calendarisation and de-seasonalisation parameters updated after the close of the half in 2011.